These notes give a detailed step-by-step procedure for a complete disassembly and reassembly of the Multo Model 113 mechanical calculator. They are also applicable, with suitable variations, to the simpler Model 3 machines. The Model 3 uses the same calculating mechanism, but omits the tens-carry and reversing mechanisms on the counter and the back-transfer mechanism on the accumulator. 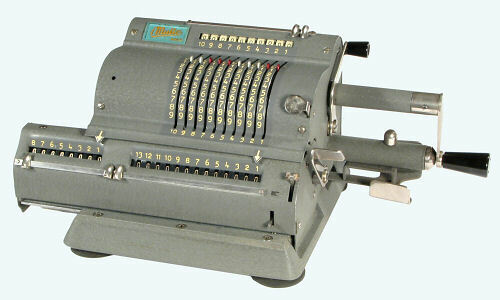 The Multo calculator was introduced by the Addo company of Sweden in 1949, to supplement their traditional line of adding and listing machines. It was discontinued when Addo was absorbed into the Advidaberg/Facit/Odhner group in 1966. From the owner's viewpoint, the Multo is a compact and attractive machine with a fairly light touch. It can be operated with the right hand alone, and is quite pleasant to use. From the technical viewpoint, the mechanism is a rather peculiar mixture of good and bad design. Some sections are ingenious, some are very nicely made, while others seem unnecessarily complex, convoluted, cheap, or just plain crude. The overall impression is of a clever design compromised by poor (ie, inexperienced) detailing, with no regard whatever for ease of assembly or future maintenance. The notes following have been prepared and refined during the rebuilding of a number of Multo machines, and may provide a useful guide to anyone faced with a similar task. At the least, they might save some unnecessary back-tracking, as the order of disassembly and reassembly is not at all obvious. The sequence described works well for me, but comes with no guarantees as to its efficiency or appropriateness. No responsibility will be taken for any consequences arising from the use of these notes by others. 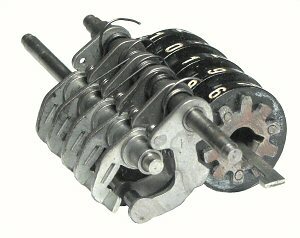 The notes are intended to be read in conjunction with the detailed mechanism description on the Multo 113 page, and with the more general information about techniques for disassembly, cleaning, and rebuilding in the Notes on overhauling a mechanical calculator. Readers unfamiliar with the principles of the pinwheel calculator should start with the Odhner mechanism page, which describe the workings of a basic pinwheel machine of the traditional design. Refer frequently to all of this material as you proceed. It is suggested that you print a copy of the instructions following, read them right through, then tick off each step as it is completed. If you make use of these notes to rebuild a Multo, I would be happy to receive your feedback, comments, or suggestions for improvement via the enquiry form. In the notes following, screws listed as (eg) M3x8 are metric thread, 3mm diameter, and 8mm overall length. Springs listed as (eg) 3x12x0.3 are (approximately) 3mm outside diameter, 12mm coil length, and 0.3mm wire diameter. Before removing any of the rolled pins, scribe an alignment mark on the shaft and hub to assist in reassembly. If the machine is in a workable condition, set the winding handle in its stop and move the carriage fully to the left. Proceed to the next section "Removing the carriage" and follow the instructions to disassemble the machine in an orderly fashion. the carriage can not be moved if the back-transfer gears are engaged with the rotor. 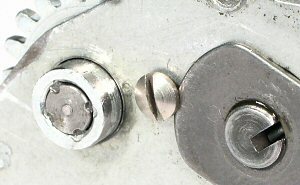 the carriage may be jammed on the right-shift pawl if the bottom cover plate has been removed and refitted incorrectly. the carriage can not be detached from the left-hand side plate until the counter reversing plate has been removed, and the reversing plate can not be removed until the carriage can be moved away from its rightmost position. the carriage can not be moved while the counter drive locating arm is attached to the side plate unless the drive pawl faces horizontally to the rear. (The drive gear and pawl will foul on the numeral wheels and may cause damage). The pawl is visible behind the register, in line with the inner face of the side plate. Remove the retainer plate and gears on the reversing plate and turn the square shaft until the pawl faces rearwards. if all else fails, remove the front cross-bar, carriage retaining bar, and rear panel assembly, then lift and remove the right-hand side plate with or without the pinwheel rotor and cross-shafts. It should then be possible to lift the carriage clear of the shift mechanism and move it to the left. When the carriage is movable, by whatever method, return to the section "Removing the carriage" and follow the instructions to complete the disassembly. Counter drive gear locating arm. Remove the covers from the top, back, and left-hand end of the main body. The right-hand cover can not be removed while the side plate is attached to the base. At the left-hand side, remove the two screws and supporting bushes at the top and bottom of the counter reversing mechanism (ie, the large plate carrying the 5 gears) and unhook the vertical spring. 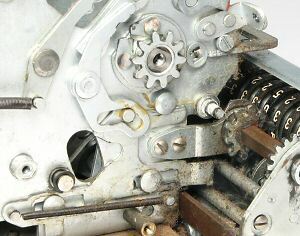 Remove the circlip from the gear which engages with the driven gear on the square shaft in the carriage. Lift the gear off its pivot, then lift off the entire reversing plate assembly. Remove the two screws holding the arm which locates the driven gear in the carriage. Remove the spring from the sliding plate at the bottom of the left-hand end plate and push the slider fully to the rear. Unhook the long coil spring under the right-hand end of the carriage and allow it to retract. Remove the three Philips-head screws which hold the carriage retainer bar to the base at the front of the machine. Move the carriage fully to the left, so that the cutout in the rectangular cover under its left-hand end will clear the roller support. Lift the carriage up and out and set it aside. At the left-hand end, remove the red indicator lever from the pivot at the top front. Unhook spring 3.5x11x0.3 from the reversing plate detent lever (top left) and remove through the rear panel. Mark the alignment of the gear and cam plate assembly on the end of the rotor shaft. Drive out the rolled pin and remove the gear assembly. From the front, remove the two screws holding the flat cross-bar above the carriage to the left and right end plates. Be careful at the right-hand side, as it is impossible to align the screwdriver at right-angles. Ease the cross-bar down off the dowel pin at the right-hand side, pull it out of the slot at the left, and remove. From the rear, remove 4 screws M3x8 and ease the back panel off the dowels at the top. Lift off the panel and check dial assembly and set aside. Collect any shims between the back panel and the left or right-hand side plates. Note that the dome nut on the handle stop pillar connects through an internal sleeve to an arm and roller on the inside of the right-hand end plate. Unscrew the dome nut, pull the sleeve inwards to clear the vertical lever, and turn the arm upwards. Undo 2 screws M3x8 (small head) and remove the handle stop plug in the outer end of the pillar. Remove the circlip from the far left-hand end of the 5mm shaft through the handle stop. Push the shaft towards the handle and disengage the pins from the two forked levers. From the front, unhook spring 3.5x19x0.3 from the left-hand end of the lower cross-shaft to the pin at inside front of the frame plate. Unhook the small spring 3.1x2.7x0.2 through the left-hand side to the lever which operates the rotor setting lock. Remove the spring and retainer. Unhook the spring from the bell hammer at the rear. From underneath, remove the right-hand rear rubber foot and 2 screws M4x18 securing the right-hand side plate. Ease the side plate off the dowel pin at its front, lift to clear obstructions, and remove complete with cross-shafts and rotor. Lift out the rotor and set aside. Recover the small back-transfer lever (with the half-round hole) if it falls out of the right-hand side plate. From the top, remove 3 screws M4x11 securing the left-hand side to the base plate. Remove the bell bracket from under the rear screw. Lift the LH side plate off the dowel pins and remove. Remove 2 screws M4x11 and flat washers holding the carriage shift mechanism to the base, and 1 screw M3x14 from underneath. Lift the shift mechanism off its dowels and remove. Recover the bell hammer spring 2.9x14x0.2 and retainer. Note the arrangement of the springs on the shift mechanism and remove. The carriage shift mechanism is permanently rivetted and can not be disassembled further. Remove and disassemble the carriage supporting brackets and rollers. From underneath, remove the remaining rubber feet and the three screws securing the bottom cover plate. Remove the plate and the long carriage spring. Withdraw the 5mm handle stop shaft and the inner sleeve. Note the arrangement of the two cross-shaft assemblies and remove. Remove the rotor non-return pawl from the right-hand end of the larger (interlock) shaft. It is not possible to disassemble these shafts further. Unhook spring 4.8x18x0.5 from the rotor clearing sector gear. Unhook the small torsion spring in the cut-away at the inside front of the side plate. Remove the rotor clearing handle and outer cover plate. Remove the trim spacer and tabbed washer from the clearing handle shaft. Remove the back-transfer button shaft, sliding latch and spring, and the small lever with the half-round hole (if it has not fallen out already) from the machined grooves in the end plate. Hold the plastic winding handle inwards against the arm of the crank. Use a suitable tool to press outwards on the spring-loaded pin until it dislodges the domed end cap. Press further to remove the circlip, then remove the pin, spring, and handle. The control levers are permanently rivetted to the right-hand side plate. It is impossible to disassemble further, or to properly clean the pivots and the handle shaft. Drive out the rolled pin and remove the gear from the right-hand end of the check dial shaft. Drive out the rolled pin and remove the cam plate and compression spring from the left-hand end. Align the notches in the dial hubs with the keyway and withdraw the shaft to the left-hand side. Unhook spring 3.6x9x0.3 and lift the interlock lever from the end of the intermediate gear shaft. Remove the thick circlip at the right-hand end and withdraw the shaft to the left. Remove the gears from the guide slots. Rotor disc staked to shaft. Loosen the two hex nuts and remove the parallel pin and collar. (The pin is not a particularly tight fit - it is held in place by the axial force when the nuts are tightened). Unhook the internal spring from the rotor setting locking bar to the left-hand rotor end plate. Remove the end plate. Remove carry discs 13 and 12, then remove the locking bar spring 3.6x7. Remove carry disc 11 and withdraw the locking bar. Rings 0,4,5,6 have red tabs. In some machines the die-cast discs have been staked to the shaft and/or to the square locating key, which can make them very difficult to remove. The die-cast alloy is very thin and easily broken. Proceed carefully, and repair the damage to the shaft and key as each disc is removed. Carefully remove the two carry pin springs from each disc. These pins are only loosely attached, and are easily lost during handling if not removed and stored securely. Remove the register clearing lever, remove the carriage end and top covers, and lift off the counter register mask. Note the arrangement of the detent lever torsion springs at the front of the counter register, then remove the 2mm support wire to release the springs. From the left-hand rear, unhook the coil spring from the last detent lever to the pin under the counter carry drive gear. Counter drive gear and cam plate. Remove 2 screws M3x5 securing the carriage left-hand end plate to the carriage base. Ease the end plate off its dowel pins and remove. Remove the square shaft and drive gear assembly if it does not come out with the end plate. (The illustration shows the outer hub of the drive gear staked rather than pinned to the shaft, so that the hub needs to be filed back to round before it can be removed. Close inspection shows that the staking has failed and the gear has slipped on the shaft. 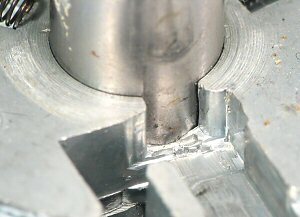 Also visible is the crude method of clamping the clearing cam plate under the edge of the screw head). Lift out the reversing reset bail assembly at the bottom rear. Line up the numeral wheels and keyway (dials to 5), then withdraw the key and spacer disc (concave side out). From underneath, undo 4 screws and remove the rectangular spring plate assembly and U-shaped bracket. From the top rear, remove 2 screws M3x5 with flat washers and drop the latch lever assembly out through the carriage base. The counter register as removed. Disengage the two front 3.5mm shafts from the centre frame plate. Slide the numeral wheels complete with carry and detent levers and their shafts slightly to the left to provide clearance, then withdraw the carry rotor from its inner bearing and remove it to the rear. Then slide the complete register assembly off the main shaft to the left. Recover the tabbed spacer at the right-hand side of the numeral wheels and the two small spacers at the right-hand side of the carry and detent shafts. Disassemble the numeral wheels, levers, and springs one stage at a time. It is almost impossible to disassemble, reassemble, or effectively clean the carry rotor without losing one or more of the 28 tiny compression springs. Disassembly is usually necessary if there is any trace of hardened oil residues from the depressions in the plates. If these are not removed the plates will stick together, causing the machine to jam and possibly damaging the register. Proceed with exteme caution if you need to work on the carry rotor. You will need a supply of 0.15mm (0.006") spring wire if you need to make replacements. Drive out the plain pin from the hub of the driving gear. Hold the rotor in a rag and unscrew the gear from the threaded shaft. Note very carefully the arrangement of the fixed and moving plates, then remove them from the square shaft, along with the cross plates, spacers, and springs. It may help to scribe the place numbers 7 to 1 (at the same angular position) on each pair of plates as they are removed. Remove 1 screw M3x8 and remove the slotted locating bar at the top of the accumulator. Remove spring 3.5x13x0.4 from the clearing control arm to the pin above the main shaft at the right-hand side. Remove compression spring 4.4x13x0.3 under the red back-transfer flag at the front right. Remove compression spring 4.5x15x0.4 under the forked interlock arm at the centre rear. Pull out the 4mm pin at the bottom front of the right-hand side. Slide the 3-arm accumulator control lever and cam disc forward and remove. Recover the 1.5mm spacer washer from the left-hand side of the lever. Set the dials to 0, set the keyway in the mainshaft to 7 o'clock, and withdraw the key with the clearing pinion and compression spring. Note that there is a small axial compression spring and a tiny (2mm) shouldered pin inside the cam assembly between the two registers. Carefully drive out the retaining pin between the cams, work the mainshaft lengthways until it is free, then very carefully withdraw the shaft to the right until just clear of the cams, keeping a finger over the left-hand end so that the spring does not fly out when released. Move the cam assembly slightly to release the spring onto your finger, remove the spring and pin, then withdraw and remove the mainshaft and remove the cam assembly. From the rear, lift out the flat shaft retainer plate which lies against the side of the central frame plate. The retainer plate engages with grooves at the inner ends of the star wheel shaft, carry lever shaft, and the detent/latch lever shaft. The grooves will frequently catch on the levers as the shafts are withdrawn and replaced. Push the star wheel shaft out towards the handle end and collect the star wheels. Unhook the spring to the clearing non-return pawl at the bottom right-hand rear. Rotate the pawl to provide clearance, then extract the carry lever shaft, carry levers, and intermediate supports. Press down on the detent levers and lift out the numeral wheels to the rear. Remove the latch lever springs along the front of the carriage, and unhook the detent lever springs at the rear. Remove the detent/latch shaft to the handle side and extract the levers and springs. Lift out the slotted locating plate at the front of the accumulator. Pull out the 4mm pin at the lower right-hand rear to release the tension on the clearing sector torsion spring. Drive out the rolled pin, withdraw the shaft, and remove the gear and spring. Remove the clearing control latch arm and spring from the post at the top rear of the outer right-hand plate. Remove 2 screws M3x8 and remove the slotted locating plate on the carriage base. Please review the material on cleaning and repair in the Notes on overhauling a mechanical calculator. Specific points that may need attention are mentioned at the appropriate places in the reassembly instructions. Repair any dents or damage to the rotor shaft and the square key. Check the cam which operates the carriage lock at the right-hand end. Some models have a nylon cam which can be damaged if it has been forced. Repair as necessary - a slightly wider notch will not cause any problems. Drill a 10mm hole in a block of wood or metal and stand the rotor shaft vertically. Clean the rotor discs, and remove burrs from hubs and keyways. Check that all the discs (including carry discs 11-13) slide freely over the shaft before starting final assembly. You don't want to be wrestling with them when the rotor is half-built. Check that the carry pins all move freely. Correct any bent or worn pins. Assemble the first disc, pins, and setting ring, and check that the pins extend and retract freely as the ring is turned. Fit the detent pin and spring, chamfered end down. Assemble discs 2-10 and rings in the same order as removed. Fit the locking bar to disc 11 (from underneath) and lower into place. Attach spring 3.6x7x0.3 to the tab on the bar. Fit carry discs 12 and 13 and the end plate, flange inwards. Attach the locking bar spring to the end plate. Fit the two nuts onto the threaded collar and fit to the shaft. Press or drive in the pin, then tighten the inner nut and lock nut. Press the locking bar inwards and check that all setting rings move freely through their full travel. Check that the locking bar returns freely and locks the rings when released. Fit the wire ring for the non-return pawl to the groove at the driving end. Support the underside of the base and drive down the dowel pin which locates the front of the right-hand side plate until there is only 2-3mm showing. Shorten the pin if necessary so that it does not protrude underneath. Assemble and fit the carriage support rollers. Find the axle pin which has been ground level with the inside of the bracket, and put this pin at the right-hand rear. Assemble and lubricate the carriage shift mechanism and place it in position on the base. The two springs under the circlip at the tail of the handle are 4.5x21x0.5. The outer spring at the handle end is 4.5x16x0.4, the inner is 3.6x8x0.3. Secure the mechanism with 2 screws M4x11 and flat washers from above and 1 screw M3x14 from underneath. Place a straightedge across the rear rollers and check that there is a minimum clearance above the carriage escapement pawls. Bend the mounting brackets slightly if necessary. Place the left-hand side plate into position on its dowels. Place the bell bracket over the rear screw hole, with a suitable flat washer over the slot. Fasten with 3 screws M4x11 into the base. Be careful of the screw heads, as it is impossible to align a screwdriver at right-angles. Reassemble the winding handle, pin, spring, and circlip, and re-fit the domed cover. Attach the small spring 3.5x5x0.3 from the sliding carriage lock along the inside bottom of the end plate to the pin at the lower rear. Attach spring 5x18x0.5 from the clearing sector gear to the same pin at the lower rear. The spring attachment plate (if fitted) goes at the top. The downward travel of the sector will be limited by a stop on the rear panel, and the forward travel by the pinwheel rotor. Lift the sector gear and insert the sleeve assembly into the handle stop pillar until about 20mm remains. Rotate the sleeve so that the arm and roller (temporarily) point upwards. Fit the rotor non-return pawl (hub outwards) to the right-hand end of the 7mm interlock shaft. Pass the arm and spring at the left-hand end of the 5mm back-transfer shaft through the bridge at the end of the interlock shaft. Place the two shafts into their bearings at the bottom front of the right-hand side plate. Insert the long 5mm pinned shaft into the sleeve in the handle stop. Fit the tabbed washer and 14x8x2.5 spacer to the rotor clearing shaft on the outer right-hand side. The tab faces into the machined groove, with the spacer on the outside. Fit the small L-shaped lever to the half-round end of the 5mm back-transfer shaft. Place the sliding latch into the (approximately) horizontal groove with the captive compression spring along its lower edge. Place the back-transfer button into the vertical groove so that the notch in its stem engages with the sliding latch. Carefully fit the outer right-hand cover and start the 4 screws M3x5. Wind the small spring on the inside front of the cover against its stop, and fit the straight end into the slot in the end of the sliding latch. Tighten the cover screws. Tie the bail on the back-transfer shaft to the handle stop pillar with a wire or strong rubber band so that the shaft can not become disengaged from the L-lever. Note that the outer cover can not be removed or refitted once the right-hand side plate is mounted to the base. Place the pinwheel rotor into its bearing in the right-hand side plate. Align the winding handle with its stop, align the notch in the carriage locking cam with its lever, and engage the driving gears. Engage the wire loop at the right-hand end of the rotor with the pin on the non-return pawl. Hold the rotor firmly against the right-hand side plate and place the assembly in (approximate) position on the base. Engage the rotor shaft with its left-hand bearing, then the two front cross-shafts, then the long handle stop shaft. Ensure that the arm at the left-hand end of the back-transfer shaft goes behind the bracket on the side plate. Engage the long handle stop shaft with the two forked locking levers and the bearing in the left-hand side plate, then lower the right-hand side onto its dowel pin. Check that the rotational locking arm on the interlock shaft aligns with the cut-out in the rotor end plate when the handle is in its home position. Correct the gear engagement if necessary. Fasten the right-hand side with 2 screws M4x18 from underneath. Remove the temporary tie from the back-transfer shaft. Engage the front cross-bar with the slot in the left-hand end plate and the dowel pin in the right-hand plate. Fasten with 2 screws M3x6. Be careful not to cross-thread the right-hand screw, as it is impossible to align a screwdriver at right angles. Fit the circlip to the left-hand end of the long handle stop shaft. Insert the small spring 3x2.7x0.2 and retainer through the left-hand side plate and attach to the rivetted lever which operates the setting lock in the rotor. This spring also provides the return force for the 5mm handle stop shaft. Draw the 3x14x0.2 spring and retainer up through the hole in the back of the shift mechanism plate and attach to the bell hammer. Position the arm on the handle stop sleeve so that the roller stands behind the vertical carriage release lever. Fit the dome nut and star washer. Attach the handle stop plug with 2 small-head screws M3x8. Rotate the clearing sector slightly forward and attach the rotor clearing handle with the large-head M4x8 screw. Check that the rotational locking arm on the interlock shaft aligns with the cut-out in the rotor end plate when the handle is in its stop. Carefully check that the rotor turns freely in both directions. The carry pins will probably foul on the arms on the interlock shaft until the back panel is installed. Press lightly on the interlock bail under the rotor to provide clearance while checking the rotation. Check that the non-return pawl engages at about 60° in both directions. Check that the sliding carriage lock at the bottom right-hand side extends whenever the handle is away from the home position. Check that the handle stop pin locks and unlocks the rotor setting rings and the carriage shift mechanism. Check that pressing backwards on the dome nut operates the carriage release pawl. Check that the back-transfer button can not be pressed until the rotor clearing handle is almost at the end of its forward stroke, and that the button returns and latches correctly. (The back-transfer gearset is latched by a separate mechanism in the carriage). Attach the bottom cover to the base plate with 3 M4x9 round-head screws. Wind the right-shift pawl clockwise against its small torsion spring. Press rearward on the carriage shift lever and tuck the pawl under the ramped arm on the bottom cover. Temporarily install the carriage frame to check the operation of the shift mechanism. Hook the rear edge of the carriage under the back-transfer lifting bail. Engage the forked arm with the interlock bail, then lower the carriage down onto its rollers. Hold the carriage down and to the left, and check the operation of the escapement mechanism and the right-shift mechanism. Make any adjustments that are necessary to obtain smooth operation in both directions. Remove the carriage frame when completed. Attach the four rubber feet with dished washers and M4x11 screws. If the feet have decomposed, replacements can be cut from 4mm (approx) neoprene sheet with a 40mm wad punch. Attach the carriage spring to the pin on the bottom cover. Pass it around the pulley and leave it in the base. Place the back panel face-up on the bench. Insert the 5mm shaft from the left-hand side and fit the intermediate gears with their hubs to the left. Fit the thick circlip at the right-hand end to retain. Place the interlock lever on the left-hand end of the shaft with the hub outwards and the forked end down. Ensure that the pinned end engages fully in the slot in the rear panel. Insert the short end of the numeral wheel shaft from the left-hand side and fit the numeral wheels into position. The leftmost pin on the shaft must pass through the notch in the supporting plate and rest on the camming surface inside. Fit the driving gear to the right-hand end, hub inwards. Align the reference mark and holes and drive or press in the rolled pin. Place the 9x33x0.4 compression spring over the left-hand end of the numeral wheel shaft. Fit the interlock cam disc with the hub outwards, align the reference mark and holes, and drive or press in the rolled pin. Fit spring 3.6x9x0.3 from the interlock lever to the pin on the frame. Turn the numeral wheel shaft until the pin at the left-hand end rests in the notch in the camming surface. Hold a hand against the numeral wheels to provide friction, rotate the driving gear a full turn, and check that the wheels return to 9. (This is correct - the driving gear makes only half a turn when installed, and will leave the wheels at zero). Set all the pinwheel rotor setting rings to zero. Working from the front of the machine, place the rear panel in its approximate position, but not so close as to engage the gears. Engage the forked interlock lever with the pin on the rotational locking arm. Pull the clearing handle slightly forward and set the bottom of the sector gear onto the stop on the rear panel. Align the dials with the zeros just above a line through the top cover screws at the left and right sides. Draw the assembly forward, jiggle it into engagement with the setting rings and sector gear, and ease it onto its dowels. Place the top cover temporarily into position and check that the zeros align with the window. Adjust as necessary. Set any rotor disc to 9, operate the clearing lever, and check that the dial and ring return fully to zero. Correct the engagement of the sector gear if there is insufficient travel. Check that the interlock cam and lever lock the rotor position during clearing. Fasten the rear panel with 4 screws M3x8. Fasten the inner guide plate assembly to the carriage base with 2 screws M3x8. Insert the front guide plate into the slots at the front of the end plates and push it down until it rests on the two stop pins. Take one of the 4x102 shafts and fit an extension to the threaded end. A 30mm M3 screw will be sufficient. By a strange coincidence the extension tool for the Facit star wheel shaft is a perfect fit. Start the shaft into the bottom front hole in the right-hand end plate. Working from the rear, place a detent lever into the first slot in the guide plates. Push the shaft in to engage the lever, and about 5mm further. Take a detent spring with the long end upwards and the short end towards you, and place it over the end of the shaft. Take a small latch lever with the pivot hole towards you and the spring hole upwards. Drop the plain end into the slot in the base, lift again so that the top falls under the front bail, and engage the shaft. Proceed in similar manner to the end of the register. Note that there is no latch lever on the last place. Push the shaft into the inner bearing until the retainer groove is level with the side plate. Remove the extension. Use a suitable tool to push and hold the top end of each detent lever into the front guide slot. Draw the long end of the spring down and hook it under the weight on the end of the detent lever. Check that the short end of the spring is properly seated against the centre guide plate. Push down on the rear of the detent levers and place the numeral wheels into position between the levers and the slots in the front plate. Place the central star wheel shaft bracket and flat washer into position on the carriage base and start the M3x5 screw. Temporarily insert the 4mm carry lever shaft, align the support bracket, tighten the screw, and remove the shaft. Attach the extension tool to the carry lever shaft, insert the shaft, and fit the carry levers and intermediate star wheel supports. Note that the rear face of the carry levers in positions 4 and 8 is shorter by about 1mm to provide clearance for the back-transfer assembly. Fit the extended bell lever into the last place, then the L-shaped back-transfer interlock lever facing downwards. Place the flat shaft retainer plate into position against the inner frame plate, with the two lower arms engaged with the grooves in the detent and carry lever shafts. Insert the numeral wheel shaft from the right-hand side. Press the wheels slightly down and rearwards to engage with the shaft. Be careful not to push the last wheel off its detent lever. Push the shaft fully home. Temporarily insert the 3.5x105 star wheel shaft. Check that it passes freely through the supports, and that the retainer plate engages with the groove. Correct as necessary, then remove the shaft. Reassemble the back-transfer shaft, gears, and lifting lugs according to your notes and markings. Place the back-transfer gear assembly into position over the frame plates. Insert any shims removed from the handle end. Feed in the star wheel shaft and fit the 2.5mm end spacer and star wheels. The 4 wheels at the support positions have shorter hubs. Fit shims (if any) at inner end of back-transfer assembly. Align the retainer groove and push the retainer plate into position. Fit the slotted locating bar across the top of the accumulator. Check that the innermost tab holds the shaft retainer plate in position, then fasten with 1 screw M3x8 at the top centre. Check that the back-transfer assembly moves freely, then attach the return spring to the inner end of the shaft. Fit the latch lever springs to the front of the register. Ensure that the springs are firmly attached to the lower pins, and that the end coils all lie neatly in the same direction. Turn all the star wheels by hand and check that the carry levers extend, latch, and return correctly. Place the clearing sector torsion spring over the hub of the gear, with the short end against the pin. Place the sector in position and insert the shaft with the flat at the top. Drive in the serrated pin from the rear. Temporarily fit the clearing handle. Pull the long end of the torsion spring forward and insert the 4x25 pin with the long shoulder to retain. Ensure that the inner end of the pin is properly engaged in the frame. Attach the spring to the clearing sector non-return pawl. Press the handle part-way down until it latches on the non-return pawl. Place the hooked end of the clearing latch arm down between the clearing shaft and the 4x25 pin. Fit the latch arm to the pivot post at the top, fit the circlip, and attach spring 3.3x4x0.2 to the pin at the top of the frame. Carefully withdraw the numeral wheel shaft until the inner end is level with the accumulator end plate. Place the interlock cam assembly into position between the two central plates, with the cams to the left and the internal groove at the bottom. Start the shaft into the right-hand end of the cam. Fit the tiny flanged pin 2.0x3.3mm into the end of the 3x14x0.3 compression spring and place it into the groove inside the cam assembly with the pin to the left. Push the shaft a little further to hold the spring. Very carefully tuck the pin down and behind the frame plate, then push the shaft through to retain. Take extreme care during this operation. Wear eye protection, and keep a finger over the end to ensure that the spring and pin can not fly out if dislodged. Hold the cam assembly and turn the shaft so that the keyway is at the bottom. Align the holes and carefully insert the tapered pin. Rotate the numeral wheel shaft until the keyway aligns with the slot in the right-hand end plate at the 7 o'clock position, then set the numeral wheels to zero. Place the 9.5x17x0.5 compression spring onto the hub of the clearing pinion. Place the assembly onto the clearing rack with the spring resting against the small cross-bar at the end. Support the carriage on a block (or over the edge of the bench) so that the clearing handle can make a full stroke. Latch the clearing handle partly down, align the long end of the rack cross-bar with the frame cut-out at 1 o'clock, and insert the rack into the keyway. Release the handle. Rotate the pinion until the step on its inner hub aligns with the driven step on the shaft. Hold the pinion at this angle, move it clear of the sector, then bring the sector down until there are 4 teeth showing above the pinion. Engage the pinion and sector, hold the rack inwards, and complete the handle stroke. The long end of the cross-bar should advance to the 4 o'clock position, aligned with the 4mm spring retainer pin. If not, rotate the shaft clockwise back to the 1 o'clock position and repeat. When the engagement is correct, hold the clearing rack inwards and slide the clearing control cam assembly into position, with one disc on either side of the outer frame plate. Insert the 4x24 stepped retainer pin with 7.5x4x1.5 spacer washer at left-hand side. Fit spring 3.5x13x0.4 from the vertical arm on the control cam assembly to the pin at the top of the frame. Fit 4.5x14x0.3 compression spring under the back-transfer latch lever and flag at right-hand front. Fit 4.5x15x0.4 compression spring under the forked interlock lever at the centre rear. Set the dials at random, operate the clearing lever, and check that all dials return to zero. Operate the lever again and check that the dials do not move when starting from zero. Set the dials at random. Press the accumulator clearing control lever and check that it latches. Operate the clearing lever and check that the dials do not clear. Check that the control lever releases as the clearing lever reaches the end of its forward stroke. Lift the back-transfer gear shaft. Check that it latches, and that it releases when the manual release lever is pressed. Latch it again, operate the clearing handle, and check that it releases automatically as the clearing lever begins its return stroke. Check that the cross-bar at the end of the clearing rack does not foul on the back-transfer indicator flag in either the raised or lowered position. Check that the two followers on the central cam assembly both drop when the numeral wheel shaft reaches its home position. Place the fixed discs (with the round locating pins) in order along the bench, starting with the widest, with the detent notches at the top. The pins on discs 1,2,6,7 should be vertical, 3,4,5 horizontal. Place the moving discs (with the long actuating pins) in order, starting with the narrowest, with the pins upwards. The pins must progress in regular steps to the widest and back again. The second-narrowest is actually the last. Place the first (widest) fixed disc onto the square shaft. Fit the cylindrical spacer, cross-plate, and moving disc. The detent notch and the actuating pins should both face upwards. Continue to the end. Check that the detent notches are all aligned, and that the actuating pins advance by regular increments on each side. Fit the flat washer and shims (if any), and screw on the driving gear. Align the holes and replace the pin. Insert the 28 springs using a fine pair of tweezers and a fine Exacto blade. Some rebuilders may find it easier to insert the springs progressively as the rotor is assembled. Fit the carry latch lever assembly to the base with 2 screws M3x5 and 10mm flat washers, but do not tighten. Remove the clearing handle. Drill a 12mm hole in a suitable block of wood or metal and stand the carriage vertically on the right-hand end. Place the tabbed spacer onto the numeral wheel shaft. Insert the shouldered 3.5mm detent lever shaft into the 3mm hole in front of the numeral wheel shaft. Fit the spacer washer and the first detent lever. Place the first numeral wheel in position over the detent lever. Stand the carry rotor assembly in its bearing, with the pins on the innermost disc facing towards the numeral wheel. Place the detent lever torsion spring over the hub of the lever, with the long end in front of the small pin. Place the carry lever shaft into the second 3mm hole. Fit the spacer washer, then fit the first carry lever with its cam end inside the numeral wheel. Fit the next detent lever, wheel, etc in similar manner to the end. Note that the last detent lever has a long coil spring which passes above the carry rotor and towards the rear. Align the numeral wheel slots with the keyway (dials to 4.5), align the tab on the inner spacer, and insert the clearing key until it rests on the pin and spring in the central cam assembly. Fit the dished end spacer over the long pin and the numeral wheel shaft, with the flat side inwards. Stand the counter reversing reset bail assembly in position at the rear, with the long pin through the central frame plate. Fit the drive pawl, gear, and locating arm assembly onto the square drive shaft with the gear to the outside. Face the short tooth on the gear towards the numeral wheels and stand the shaft in its bearing. From the underside, rotate the carry rotor half a turn so that the pins on the outer disc face the numeral wheels and the row of depressions on the fixed discs aligns with the projections in the centre of the latch levers. Place the left-hand end plate in position, insert the shafts into their bearings, and engage the small rivetted gear with the two larger gears. Check that the alignment of the drive gear and carry rotor is still correct. Seat the end plate on its dowels and fasten with 2 screws M3x5. Fit the clearing cam plate with the step aligned with the end of the clearing key. Fasten with M3x5 at the front and a cut-down M3x3.5 at the rear (to avoid fouling on the drive shaft gear). The screw heads will break if over-tightened. From the front, check that the long ends of the detent lever springs are all in front of their pins. Draw the carry lever tension springs forward and attach them to the same pins. Check that the bottoms of the carry levers rest evenly on the tips of the latch levers underneath. Adjust the latch lever mounting plate if necessary and tighten the screws. Fit the rectangular spring plate and U-bracket under the latch levers, with the cut-out to the front. Fasten with 4 screws M3x5. Place the long end of each detent lever spring against the front of its pin, lift the short end, and insert the 2mm retainer wire. Attach the long coil spring on the last detent lever to the pin at the inside rear of the side plate. Replace the clearing lever. Set the dials at random, operate the lever, and check that the dials return to zero. Operate again, and check that the dials do not move when starting from zero. Adjust the angular position of the clearing cam plate to obtain correct operation. Align the counter drive pawl with the gear on the first numeral wheel and rotate the square drive shaft (or gear) by hand. Verify that ripple carries operate correctly in both directions. Fit the counter register mask with the front fingers under the detent spring retainer wire. The tricky part of replacing the carriage is to get the back-transfer gears above the lifting arm in the main body, and the L-shaped back-transfer interlock arm above the horizontal interlock bail. Attach a light wire to the free end of the carriage return spring and tie it to the handle stop with a slight tension. Check that the right-shift pawl is still tucked under the ramped arm on the bottom cover. Push the counter reversing reset slider (bottom left-hand side plate) fully to the rear. Lift the back-transfer gear assembly (behind the accumulator) until it latches. (Do not raise the lifting bail in the main body). Hook a wire under the L-shaped arm at the centre rear, pull it up against the back-transfer assembly, and tie it to the retainer wire at the front. Slide the counter drive gear and locating arm fully to the left. Hold the carriage in both hands, with the left-hand end slightly down and to the rear. Roll slightly forwards and place the cut-out in the rectangular cover (underneath) behind the left-hand front roller. Lower the carriage under the front cross-bar and straighten up. Ease the carriage up and rearwards until the back-transfer gears engage fully with the setting rings. Be careful not to press the release lever. Look down beside the rotor at the left-hand end. Press down on the flat interlock bail and ease the carriage rearwards so that the L-shaped arm rests on the top of the bail. Engage the forked arm with the front edge of the bail. Jiggle the carriage slightly, without disturbing the arrangements at the rear, until it falls into place. Unhook the wire from the L-shaped arm, release the back-transfer latch, and check that the carriage moves correctly. If not, remove and repeat the procedure. It may take several attempts to get it right. Fit the front carriage retainer bar to the base with 3 Philips-head trim screws M3x10. Push the carriage fully to the right. Stand the machine on its left-hand end, pull out the return spring, and attach it to the pin under the end of the carriage. Check that left and right shifts work correctly. Check that the carriage runs freely to the far left when released by the dome nut. Check that the pins on the main rotor align correctly with the accumulator star wheels. Set a 1 in the first place of the rotor. Turn the handle carefully and check that ripple carries operate smoothly across all places and in both directions. Assemble the driving plate and gear on the left-hand end of the rotor shaft and press in the 2x11 rolled pin. Connect spring 3x6x0.2 between the two arms on the driving plate. The spring should be at the 4 o'clock position with the handle in its stop. Attach the long spring 2.2x40x0.25 from the reversing plate resetting slider to the pin at the bottom rear. Pass spring 3.5x12x0.3 and retainer through the back panel and attach to reversing plate detent lever at the top rear. Attach the counter drive locating arm to the frame with 2 screws M3x6. Check that the arm is centred on the gear and does not restrict the rotation or the carriage travel. Fit the reversing indicator to the pin at the top front, with the red flag down. Check that the resetting roller on the back of the reversing plate is free to turn. Fit 5 identical gears to the reversing plate with the hubs outwards. Fit the retainer plate and secure with 3 circlips. Place the reversing plate in position on its front pivot, engage the detent lever, operating pawl, and red flag, and fasten with 2 shouldered bushings and M3x8 screws. The cut-away bushing goes at the top with the flat side up. Attach the balance spring 3.3x30x0.25 from the bottom rear of the reversing plate to the pin at the top of the frame. Attach spring 3x12x0.25 from the operating pawl to the pin behind. Check that the counter drive shaft is still in its home position, then fit the sixth gear and circlip to the pivot pin. Turn the winding handle slowly forward. Check that the reversing plate follows and latches, and that the counter counts forward. Pull the resetting slider (bottom) rearwards and check that the reversing plate returns to its neutral position. Set the carriage in its leftmost position and check that ripple carries operate smoothly across all places and in both directions. Refit the outer covers with 20 screws. Be careful to select the correct lengths for the carriage cover screws. the arms on the interlock shaft could have been shaped so that they did not foul on (and risk damaging) the main rotor carry pins while the machine was only partially assembled. the retainer plate for the accumulator shafts could have been placed at the outer rather than the inner end, so that the grooves would not catch on the levers during installation and removal. a change of half a millimeter in the diameter of the counter dials or the carry rotor discs would have allowed the carry rotor to be removed without disturbing the register. a circlip instead of a rivetted pin on the right-hand end plate would have allowed the winding handle shaft to be removed for cleaning and lubrication. The peculiar arrangement of the springs and pins on the counter register detent levers suggests that the torsion springs were a late addition, and possibly a field update. The mechanism appears to have been designed so that the single coil spring would serve both the detent and the carry levers. The torsion springs were probably added later to reduce the likelihood of counter overruns, but the original arrangement was not removed or revised for consistency. The Multo seems to be unusually susceptible to carry timing errors in both the accumulator and the counter. On the accumulator side, the inclusion of the tenth setting place on the rotor reduces the time available for the carry phase of the machine cycle. A situation can arise during secondary (or ripple) carries where the rotor carry pin arrives at the operating position before the carry lever has completed its rearward travel. The pin will strike against the top of the carry lever rather than riding over the camming surface, the machine will jam, and the pin may be bent or damaged. This situation is more likely to occur if there is any misalignment of the carriage due to wear, the lack of lateral adjustment, or the generally rather coarse construction of the carriage shift (and locating) mechanism. (Note that the shift mechanism mounting holes are actually lateral slots, but once the mechanism is set and dowelled into position in the factory no further adjustment is possible). Watch the interaction of the pins and carry levers very carefully while performing ripple carries in both directions, and look for any potential problems. It may be necessary to move the rotor discs bodily to the left by fitting shims under the first disc, or to correct problems in the 12th or 13th place with shims between the last carry discs. Do not attempt to add shims between the pinwheels. Although the counter has only eight places, the time available for the carry phase is reduced by the need to release and reset the carry latch levers at the end of the cycle. A situation can arise during secondary (or ripple) carries where the latch in the 7th or 8th place is released before the carry rotor has fully advanced the numeral wheel. This stiuation is made worse by the truncated (flat-topped) teeth on the counter detent gears. In a traditional design the detent lever would push the numeral wheel home once it had reached the half-way point, but the Multo wheels must be pushed almost fully home before the detent lever can take effect. The end result is that the numeral wheel may be left half-way between two digits, causing the counter to jam on the next machine cycle or to produce an incorrect registration. Watch the interaction of the pins and carry levers very carefully while performing ripple carries in both directions, and look for any potential problems. It may be necessary to bend the lower tails of the carry levers on the 7th or 8th place to adjust the timing of their release. Still, in spite of its design and manufacturing problems, a cleaned, rebuilt, and properly adjusted Multo is quite a pleasant machine to use. Original text and images Copyright © John Wolff 2008-09.